Hope you had a safe and tasty Thanksgiving, if you’re in to that sort of thing. 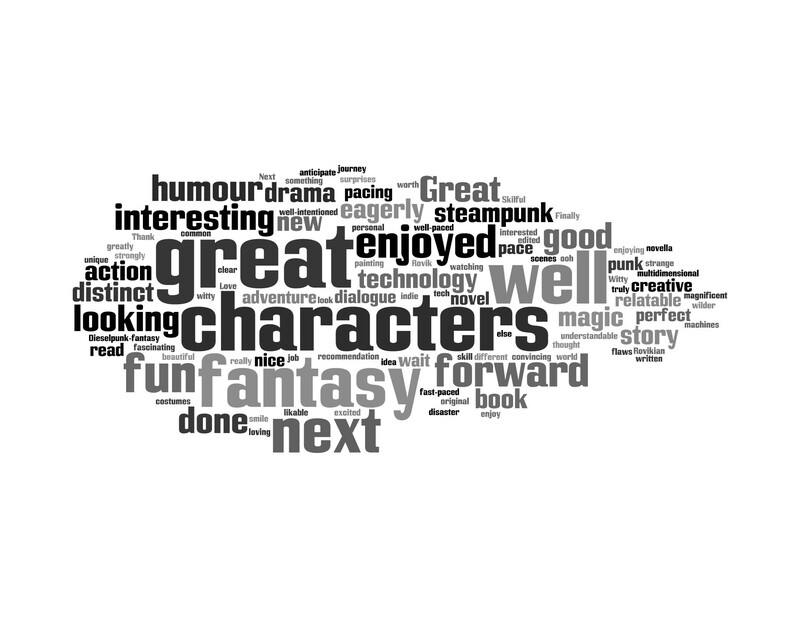 It’s been great to see reviews coming in for the Mechanized Wizardry books over the months. Now that there’s a chunk of text out there, I thought I’d use Wordle to see if there was any commonality in the things people on Amazon, Podiobooks, and across the web were saying. “Great Characters, Fun Fantasy” is a tremendous tag line just as it is. It’s a little hard to tell in this layout, but “looking forward” and “next” (as in “next book”) showed up almost as consistently as any descriptive words. So consensus seems to be that I should be writing faster. The books must be doing okay outside the US, because Americans would know how to spell “humor” correctly. Seriously though, it made my night to see everything laid out like this. I’ve only been at this self-publishing thing for a year and a half now. To already have people like you saying such nice things about the books and being so supportive is absolutely thrilling. I’m very grateful to everyone who’s taken a chance on an indie series and a scrappy young author, and I’m “looking forward” to supplying you with the great characters and fun fantasy you so crave. Big announcement coming this weekend. "I told you that story so I could tell you this one."